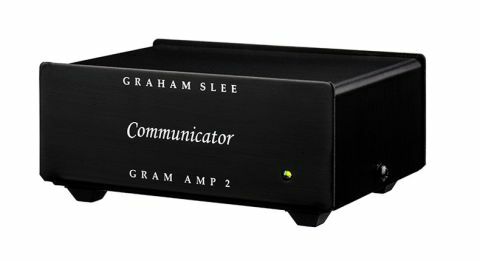 Graham Slee Gram Amp 2 Communicator review | What Hi-Fi? We don’t play favourites at What Hi-Fi?, but there are some products we find so endearing it’d be a shame to have to say a bad word about them. The Graham Slee Gram Amp 2 Communicator, an Award-winner in years gone by, falls within that bracket - even though it has been five years since we were first treated to its talents. We were a little apprehensive when testing it against renewed opposition, worried that it wouldn’t stand up so well to the competition strengthened by half a decade’s progress and one-upmanship. Of course, if that had been the case, we wouldn’t have hesitated to say so. Nevertheless, it’s something of a relief to find this Graham Slee has stood the test of time. The Gram Amp was, effectively, the product that put this British company firmly on the hi-fi map - though you might not think so to look at it. Keeping things gloriously simple, it’s a moving-magnet phono stage with one set of inputs and one set of outputs. Graham Slee makes no bones about the “low-cost anodized aluminium enclosure”. This is all about high quality sound on a budget, a two fingers up to the gimmicks, bells and whistles you might find included with more expensive, supposedly higher-end phono stages. The role it plays is singular but significant, and it performs it with vigour. It’s difficult to imagine a more detailed presentation from a phono stage for the money. There are rivals with an equally wide soundstage, but they perhaps don’t shine the spotlight so intensely on each strand. That’s irrespective of arrangement or recording. The timbre is clear in Nils Frahm’s piano, its hammers covered in thick felt. The Gram Amp also immerses itself in Mogwai’s overloaded instrumental textures, graphically describing to us its guts; even lo-fi recordings of The Tallest Man On Earth are treated with the respect and insight of any hi-fi-ready production. Detail is where the Gram Amp stands out most against its nearest competitors, but it tackles most other facets of performance at least as well. Timing is as precise and articulate as we could hope for and, though it lacks a little venom in its punch when pitted against Rega’s class-leading Fono MM MK3, this Graham Slee’s jab is far from limp. It’s a force dynamically as well, especially in the upper register. Melodies dominating the upper mid-range and treble are handled with more expression than most rivals and, though perhaps not as startling a couple of octaves down, the Gram Amp refuses to neglect dynamics and varying intensities in the baritone and bass. But Graham Slee also has another trick up its sleeve in the form of its PSU1 linear audio power supply upgrade. This is a 24V DC brick, which combats the innate voltage and noise variations in household power via the included AC mains plug. It matches the price of the Gram Amp - which may seem steep enough to nudge this phono stage into a new realm of competitors. But the sonic upturn is as stark as if you’d spent £400 on a brand new unit. As well as improving on each of the amp’s already superlative talents, powering via the PSU1 adds some extra muscle and widens the dynamic expression in the low-end – in our view, the Gram Amp’s only (relative) weaknesses. Of course, it takes a comparable system to properly expose those improvements, but the fact you can upgrade the Gram Amp along with other components without replacing the unit itself is some intuitive future-proofing. As a small company in this market, Graham Slee doesn’t have a vault full of its products ready for shipping, with many of its units built to order. That means you may not be plugging your phono stage into your system quite as soon as if you would if you’d bought from a bigger brand, but we can testify to it being well worth any wait. Rarely are we so pleased when testing a five-year-old product to find it sounding just as sweet as we remember. The Gram Amp remains a class-leader.